It can be an effort to enjoy the outdoors when the cold winter months approach but with the large heated glasshouses and the holly bushes fruiting, winter is the time of year Grappenhall Hays Walled Garden is a real joy to visit. Located near the Appleton area of Warrington, the garden was awarded a two million pound grant from the Heritage Lottery Fund to rebuild the glasshouses that were originally built in the 1930s as part of the kitchen gardens to a large manor house owned by the Parr Family. The project was completed in 2014 and today they are a great place to relax and enjoy a break from the Christmas madness. A café in the main central glasshouse sells freshly baked cakes and bistro style coffee as well as a good variety of meals including vegetarian and vegan options. There is plenty of space to sit and read a book or for the children to play and draw and it’s always nice and warm inside. The walled garden combines both a pleasure garden with beautiful herbaceous borders, ponds and wildlife, and a kitchen garden that produces fruit, herbs and vegetables. There is a magnificent variety of holly bushes which are spectacular this time of year. Seasonal produce from the kitchen garden is also sold to visitors to fund further enhancements as well as used by the café to make up the specials board. The gounds are maintained by a voluntary group called The Friends of Grappenhall Hays Walled Garden and this year they have added some beehives to the garden so hopefully next year there will be plenty of honey. Warrington Museum and Art Gallery opens it’s doors to the annual open art exhibition, which runs until 11 Nov 2018. 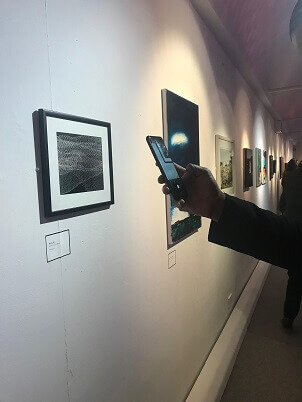 People within a 50mile radius of Warrington were invited to take part in the exhibition and this year the curators have selected work from over 300 entries to showcase the very best of art from the people of Warrington ranging from students, professionals and upcoming artists. 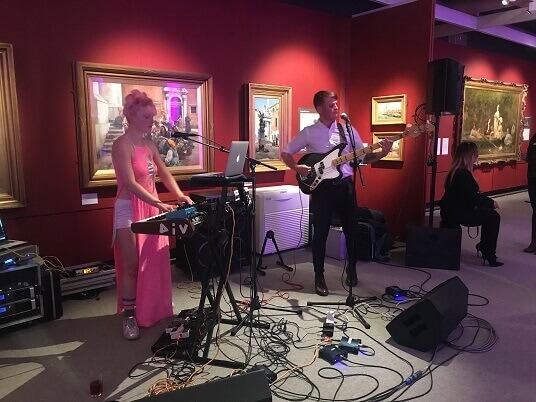 The turnout at the private view on Friday was remarkable and guests were also treated to a live music performance by VIDE0. It is the eighth year this exhibition has taken place and each year the work on show gets better and better. The exhibition includes work from a range of disciplines and created from a variety of media including lens-based photography, camera-less photography, printmaking, textiles, installations, painting and drawing, sculpture and mixed media works. In particular this year there are many works that are easy to relate to and some possessing a humorous quality such as Nichola Smith’s badge “My name is not mum” and also a huge knitted shopping list full of weird and wonderful items entitled To Do by Marie Jones which drapes from the ceiling down to the ground floor making full use of the gallery space. Culture Warrington are very committed to supporting local and regional emerging artists. 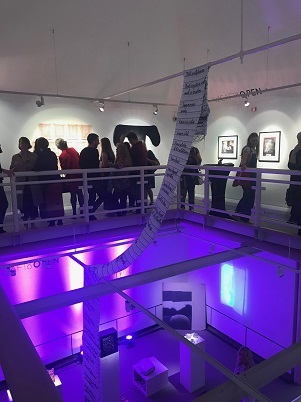 The opening of the exhibition marks the end of a 12 month program of exhibitions and events as part of the Warrington Contemporary Arts Festival. The theme this year was History of the Future, which was focused on collecting, archiving and presenting new work. The final commission this year is Hannah Leighton-Boyce’s installation entitled Dreaming of Dead Fish. The installation displays antique cut glass vanity dishes, taking an old sentimental object and transforming it into something new. As you walk into the space, overhead projectors cover the walls with enlarged images of the cut glass accentuating the clearness of the glass and sharply cut design which are qualities that are commonly associated and identified with this object. 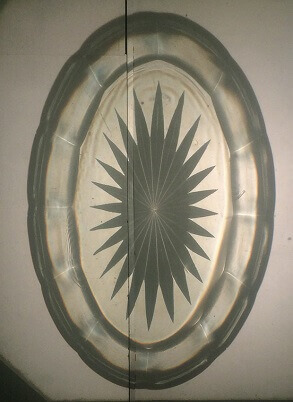 Presented right next to the projections sit the same vanity dishes completely covered in jet black candle soot giving a completely different set of qualities to the same object. The sharpness of the cut glass this time cuts through a soft velvety fully matt black powdered surface, the transparency of the glass now replaced by opacity. You need to get up close and personal to fully appreciate the powdered surface and the sooted dishes are something you really want to touch but know you shouldn’t. They are displayed vertically to the wall which also takes away the functionality, making it even more difficult to identify as the object it once was. Hannah has made these works by burning the candle underneath the item therefor working on the pieces upside down and in a horizontal position. Making art with candle soot was a technique originally used by the Surrealists who believed the flickering of the light could capture the creativity of the subconscious mind. It is the subconscious mind that is responsible for dreams, death being symbolic of the old giving way to the new, and fish representing something that we catch. You can see Dreaming of Dead Fish at Warrington Museum and Art Gallery until 27th Oct 2018. Admission is free. It was great to see the Makers Market busy even on a rainy day in August. I never thought I would say this about Warrington, but the drought is over, the weather has broken and it’s safe to go out in the mid-day sun again. If you haven’t already visited the Maker’s Market on Palmyra Square then it is definitely worth a visit and a great way to break up a Sunday afternoon. The new market, first started in March this year, has attracted thousands of shoppers looking for quality handmade items made both locally and within the fair-trade scheme. 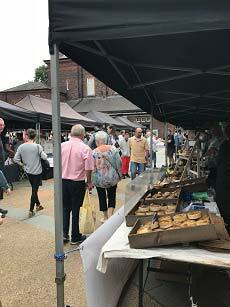 Located in the heart of Warrington’s cultural quarter, the stalls offer a variety of arts and crafts, vintage items and antiques, ceramics, clothing and textiles, soaps and candles, children’s toys, as well as house and garden plants. There's really some great gift ideas to inspire you. The food stalls are also bustling with readymade foods to eat on the go, from fresh artisan produce and homemade foods, to samosas and biltong. We even have our own 3 Pugs Gin from the Orford area of Warrington giving free tasting sessions. Next to the hot food stalls there are live events such as music and cooking demonstrations. We’ve enjoyed crêpes, burgers, and fresh homemade lemonade while enjoying the free entertainment on the square. The market runs every second Sunday of each month.